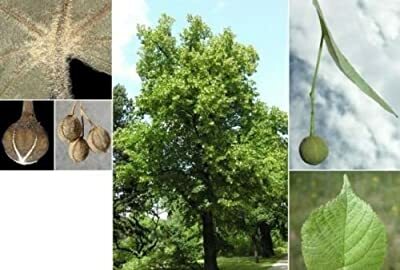 The Big Leaf Linden is a deciduous tree native to much of Europe. It is frequently planted as an ornamental tree in parks, or as a shade tree or a lawn tree. It is a narrowly domed tree with a moderate growth rate. The foliage consists of simple, alternately arranged leaves. The autumn foliage is yellow-green to yellow. The small, fragrant, yellowish-white flowers are arranged in drooping, clusters in groups of 3 to 4. Their whitish-green, leaf-like bracts have an oblong shape. The flowers are pollinated by bees. The fruit is a small, round, cream-colored nutlet. It has a woody shell with 3-5 ridges. The Big Leaf Linden can reach heights of up to 100 feet.